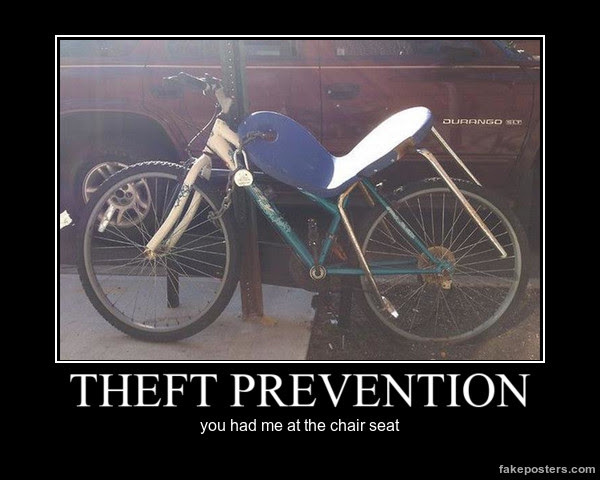 One of the more effective strategies for preventing theft (or other types of attacks) is to make things undesirable. If the rewards aren't there then the crooks won't come for them. In this case, I don't think anyone wants to steal that bike (it can't be comfortable to peddle). When Will The Stock Photo Insanity End? Why Don't I Just Stick My Car Key To My Car? Do Atheists Have More Privacy? Should All Locks Have Keys? Do You Feel Pretty, Punk? The Many Faces Of "There Is No Cloud"
Ever Felt Not Quite Safe In Your Hotel Room? How Else Can They Get The Cookies?